The Steel Greaves are shoes in Splatoon 2. They are a 2-star item produced by amiibo and come with the primary ability Object Shredder. They are only available from the Octoling Boy amiibo. They cannot be ordered through Murch. The Steel Greaves are a pair of medieval knight's boots. 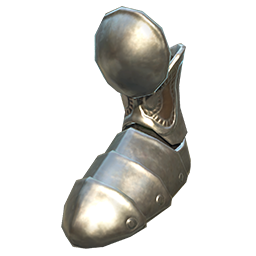 The Steel Greaves come with Object Shredder as a main ability, which, being exclusive to the main slot of Shoes, prevents the wearer from also having Drop Roller or Stealth Jump. As a 2-star item, the Steel Greaves have two additional slots for secondary abilities. Since they are made by the amiibo brand, they have equal chances to roll any secondary ability. This page was last edited on 14 November 2018, at 05:22.